I was curious about what a „Wiki“ might be, and I was surprised to learn and find much more than I had expected. 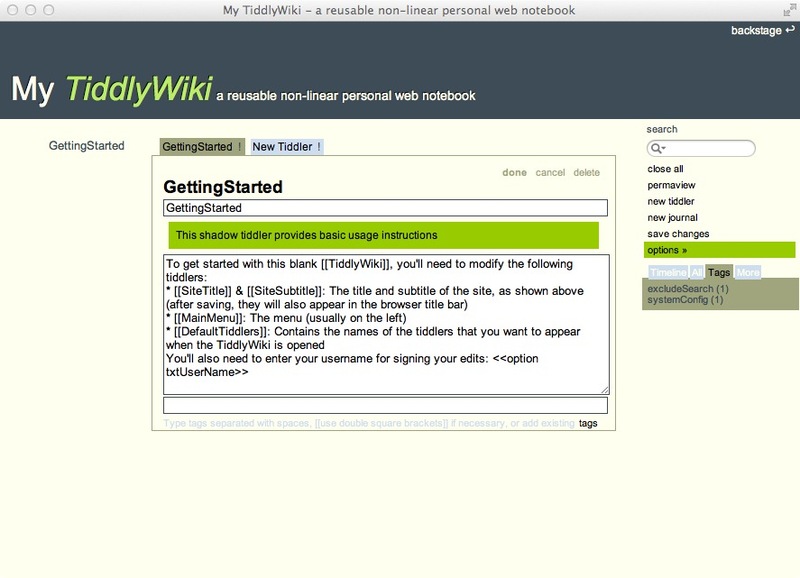 Say hello to TiddlyWiki, your free personal advanced notepad! A Wiki in general is a system to store and retrieve information, especially when working together in groups. Therefore Wikis are web based and they do not only show their contents but also allow you to edit them. If you think about Wikipedia for a moment, the special thing about it is the fact that you may not only read an article, but also may write one yourself, which makes this collection of information so big and still growing. Tiddly Wiki is a small Wiki designed for personal use. It runs in your browser and stores information in one single file on your computer. Now the cool thing about Wikis is that they store information in a non-linear way, Which means that you don‘t have one page after another, but you write an entry and may hide it and forget about, but can easily retrieve it by searching for keywords or tags you have given it or looking in a timeline, where every entry is stored in chronological order. There are many ways to customise Tiddly Wiki, as it is developed by a large community adding content and plugins to expand it‘s functionality. Just as a Wiki‘s content may be read and edited by everyone, the Wiki itself may be used and extended by everyone. This is perfect for me! As you might have noticed I like to edit the software I use to fit my personal expectations and needs, so of course I made some little tweaks, and of course I offer my personal edition for you to download. So here we go, just download „My Tiddly Wiki“ and try it! A short introduction to basic functions is included. It‘s more or less original version of Tiddly Wiki with just a few tweaks in colour and one plugin which shows your entries in tabs (which is what I was looking for since a friend asked me for just that functionality which he missed in any other software he knew). If you want to learn more about Tiddly Wiki you might also want to look at Wikipedia or visit the original Tiddly Wiki Website. My name is Deoclides and I saw that you had had problems wih the Just Map It! plugin a couple of years ago (https://wordpress.org/support/topic/plugin-just-map-it-cant-get-jmi-to-work?replies=25). I’ve just installed on my wp panel but I don’t know how to activate it. It seens that Social Computing is vanished from the web and the plugin is not working anymore. Can you confirm me if is just my impression or is really this? the plugin worked for me after some trouble in the beginning. I remember that it needed two other plugins to be installed, maybe you should check that on your system. I still like the concept of it very much and would love to have it running again, but it seemed to me it wasn’t developed any further since I installed it, and to me it had two major problems: It took a while longer to load a page with the plugin activated, which would have been o.k., but it also didn’t find all articles connected with a topic, although the relationship was obvious. So I think it should work, but you may evaluate for yourself if it’s worth troubleshooting.